The extraction of oil in Pennsylvania has been ongoing since before the Civil War, and the natural gas industry is also well established. The boom in production due to the hydraulic fracturing of gas from the Marcellus Shale formation is, however, quite recent. A proper analysis of the oil and gas industry starts with the question, “How many wells of each type are there?” Unfortunately, the figures for non-Marcellus Shale and total wells are approximate. On their website, the Pennsylvania Spatial Data Access (PASDA) maintains a list of over 123,000 oil and gas locations in the state, based on Department of Environmental Protection (DEP) data. Through our efforts, CHEC has found over 6,000 more locations from permit information available on the DEP website, bringing the total of oil and gas locations to over 129,000. Some of these 129,000 locations were undoubtedly never spudded, but that level of information is not available at this time. There is data as to which Marcellus Shale wells have been spudded, as all of the Marcellus Shale wells are recent enough to have digital information about them on the DEP website. I compiled this information about drilled wells from information that is on the DEP website, and it indicates that there are only ten wells that were drilled horizontally that were not extracting from the Marcellus Shale formation. 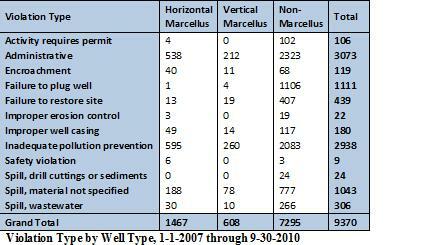 I have seen comments in violation data indicating that wells not flagged as Marcellus had become Marcellus wells by drilling deeper. I do not have data to suggest that this situation accounts for all ten horizontal wells that are not flagged as Marcellus Shale, but I would not find that surprising. In the past few days, the DEP has posted oil and gas violation data on their website. Several weeks ago, the DEP provided CHEC with a comprehensive list of 9,370 violations in the period between January 1, 2007 and September 30, 2010. This is more than ten times the number of violations that has been obtained from both Utah and West Virginia, although the nature of this list is also far more complete than that of the other two states. Additionally, Pennsylvania has a more extensive oil and gas industry than either of the other two states. For example, the table above shows over three thousand administrative violations, one thousand instances of failing to plug a well, and four hundred cases where the well operator failed to restore a site after the conclusion of drilling operations. The nature of the violation information from the other two states leads me to suspect that their violation lists were simply compiled differently, and that these problems that the Pennsylvania DEP regulators have seen so much of are not absent in the other states. I have condensed the original list of 109 violations categories into 12 in order to facilitate analysis. Some of these distinctions were relatively simple to collapse. For example, wastewater spills and brine spills clearly belong together. Other examples were less clear. One of the original categories was “Improper storage of residual waste”, which does not explain whether or not a spill had occurred. For that reason, it was included with, “Inadequate pollution prevention”, although the violation might well have been issued after an impoundment overflow. In terms of geographical distribution, we see that three contiguous counties in the northeast quadrant of the Commonwealth—Bradford, Susquehanna, and Tioga—account for a majority of the Marcellus Shale violations, Two northwestern counties—McKean and Venango—have noticeably more violations than the rest of the counties in terms of oil and gas operations that are drilled into other formations. For states where the oil and gas industry is relatively recent, it is straightforward task to compare violations to the number of permits or spudded wells. With the long history of mineral extraction in Pennsylvania, the results of that comparison here is somewhat problematic. For example, while the 1,111 instances of failing to plug a well issued during this 45 month timeframe is a frankly staggering total, only five of those were for Marcellus Shale wells. This makes sense, as the more recent Marcellus wells are more likely to still be productive, while a violation for an uncapped well could potentially be issued for a long abandoned well that was recently discovered. The point of bringing up this example is to suggest that due to the long timeframe of oil and gas operations in Pennsylvania, a straightforward comparison of Marcellus Shale to non-Marcellus Shale violations by the number of wells of each type is probably misleading. And, as mentioned above, we are not altogether clear on how many conventional wells that there are in the state in the first place. However, if we look at the number of violations per well against the more limited scope of wells which are in violation, some interesting trends come to light, and the issue of severely skewed results due to the antiquity of the conventional oil and gas industry in the state seems effectively mitigated in this analysis as well. 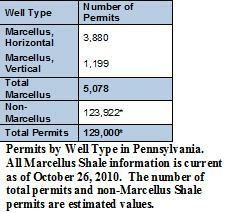 To be clear, this does not suggest that there are an average of 2.56 violations per well in Pennsylvania. It does indicate that when the DEP sees a situation in which violations must be filed, there are typically more than one problem at a time. 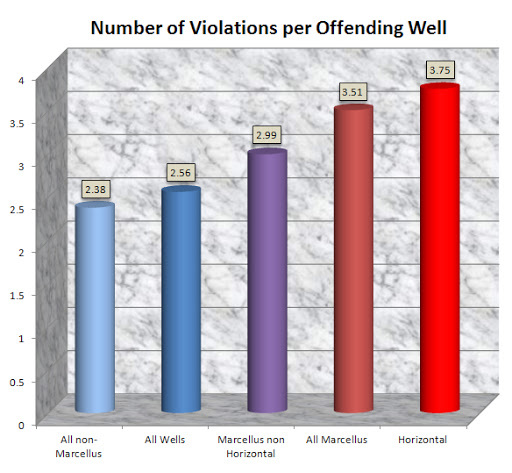 As the data above shows, wells drilled into the Marcellus Shale have a higher number of violations per offending well than do those in other formations, and the horizontally drilled Marcellus wells have more still. Thank you a lot for giving everyone an exceptionally breathtaking possiblity to read in detail from this website. It is always so terrific and full of fun for me personally and my office acquaintances to visit your site minimum 3 times every week to study the new items you have. Not to mention, I’m also usually happy with all the unbelievable information served by you. Selected 1 points in this article are completely the most beneficial we have all ever had.